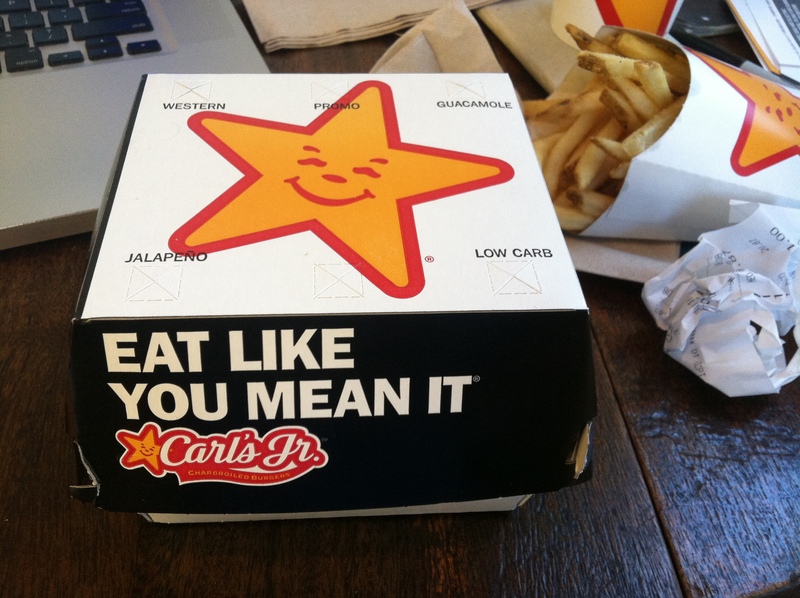 Carl’s Jr. takes great pride in its burgers. They advertise their $6 Thickburgers as a cut above the usual fast food fare, and they’re not shy about adding premium toppings to the burgers (these commercials would also be the ones that feature scantily clad women umm… thoroughly enjoying their food). The Thickburgers even now feature fresh baked buns. However, these features come at a cost, since the sandwiches are given a heftier price tag than the usual fast food fare. 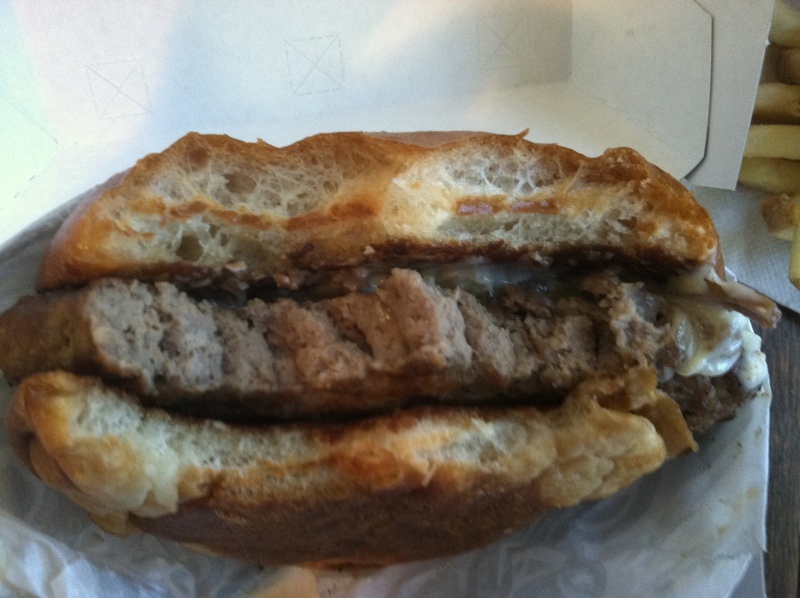 This week, I went to Carl’s Jr. to try their new Philly Cheesesteak Six Dollar Thickburger. I love burgers, I love cheesesteaks, and Terrell Owens replaced the scantily clad woman du jour in the commercials. What could possibly go wrong? Once again, I got the meal, medium size, which cost $9.87. That’s quite a premium for fast food. At that price, I could go to another fast food place and get more food or even dine at a chain sit down restaurant. 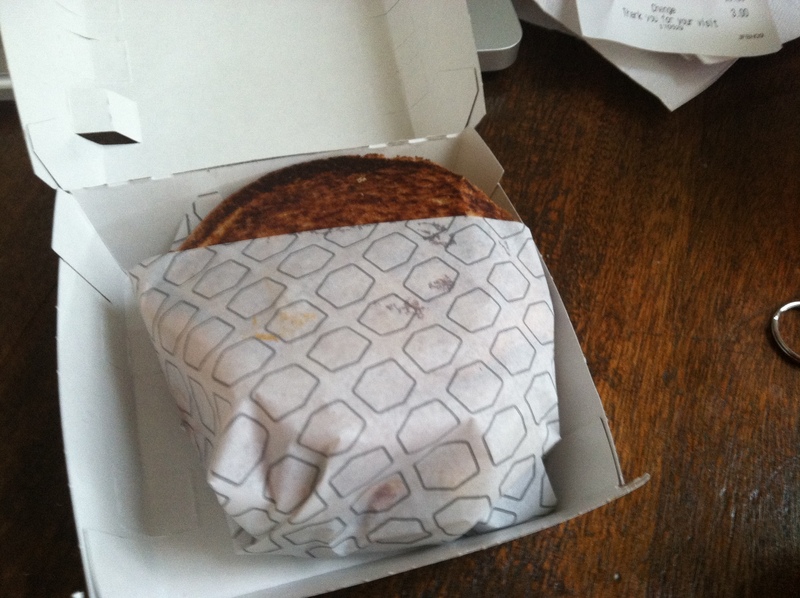 The sandwich came in a box, which it appears is becoming standard for these deluxe type burgers. 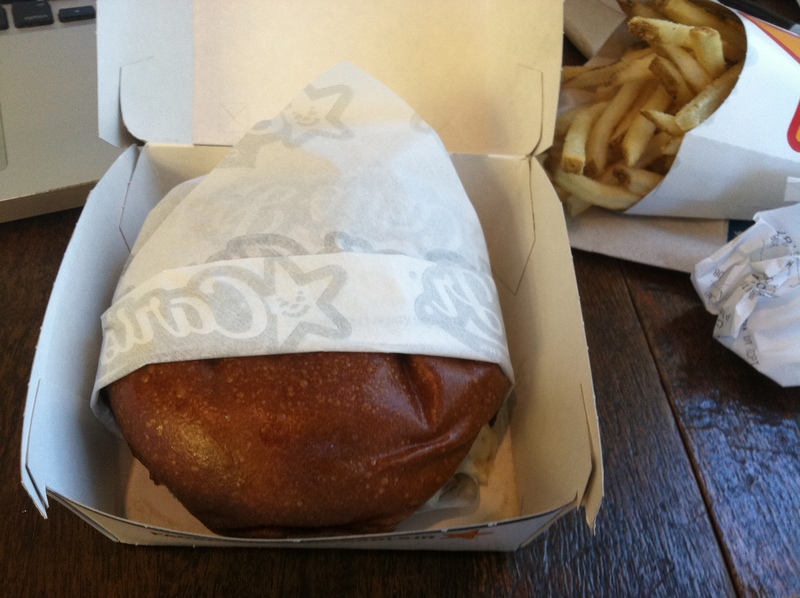 Once opened, my eyes were met by … what looked like an over baked bun wrapped in paper. Not going to lie, this did not look very appetizing upon first glance. But that doesn’t matter! 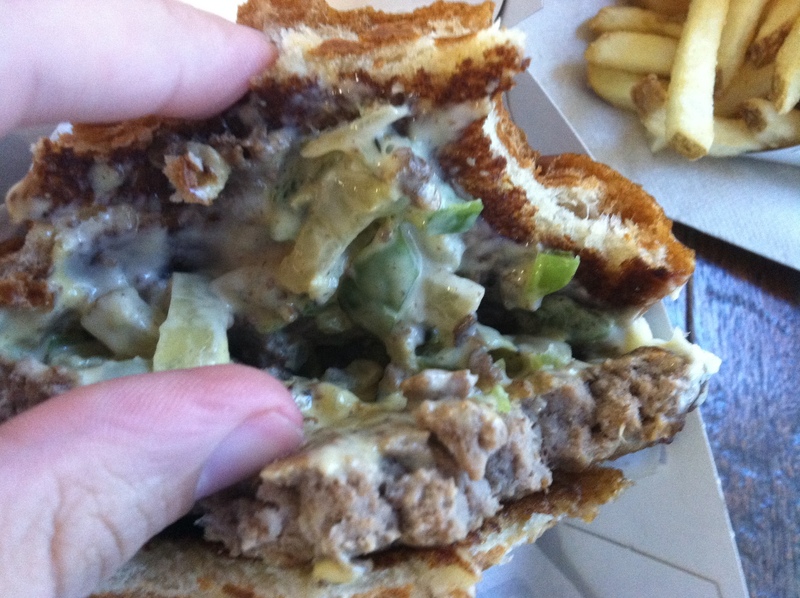 Sometimes unattractive/sloppy burgers can be even better than one that merely looks good. I definitely needed that mindset here because this thing looked gross. As I mentioned before, the bun (freshly baked!) looked like it had been baked too long. It was a dark brown. This is also the last time I’ll mention the bun. It was nothing special and didn’t really add to the proceedings. Memo to all fast food places: unless you’re going to make some great bread that adds something to the overall experience, just stop tinkering and give us the sesame seed bun. Onto the burger! It looked wet and cheesy. It was difficult to get photos because my hands were damp and filled with grease every time I touched the burger (theory: the cheesesteak topping is in a holding bin with some water/juices at the bottom- I can’t think of another reason why this was so damp). Carl’s Jr. describes the Philly Cheesesteak Thickburger as “thinly sliced steak with melted Swiss and grilled Peppers n’ Onions all on top of our Six Dollar Thickburger with cheese, served on a fresh baked bun.” There’s a lot to unpack here, so here we go. My first bite was just burger, bun and cheese. And it wasn’t bad! The burger had a decent char, and I liked the seasoning. It was a little peppery, but this seemed like a good base for the rest of the burger. Unfortunately, it went downhill from here. The burger itself was well done. I understand that fast food places are not going to make a burger medium, but when you’re dealing with a large patty, well done is just too dry. Especially here since a lot of bites were just burger, bun, and cheese. Chewing got really tiresome. It wasn’t until I’d finished half the burger that I first tasted some of the peppers and onions. 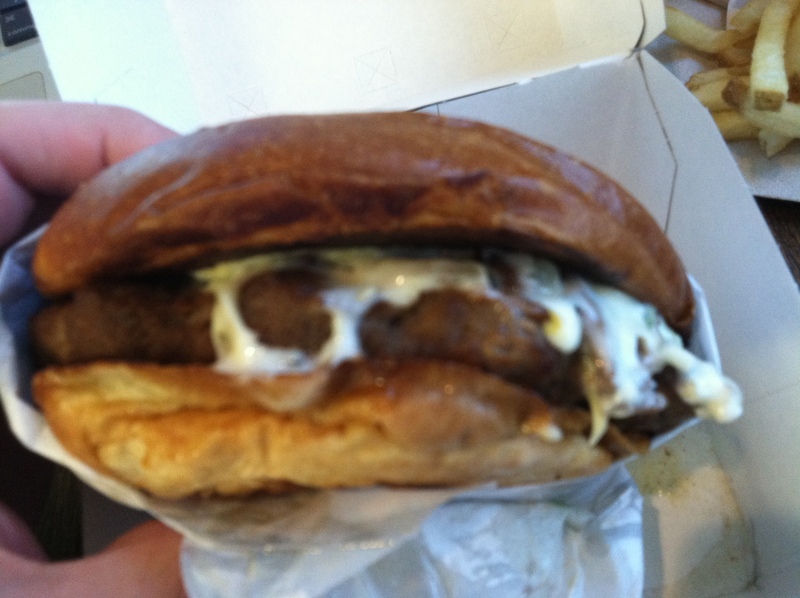 They add some much needed texture to the burger, and I liked the crunch. Howevere, they weren’t much in the taste department. I ate a pepper that fell out of the burger, and it was tasteless and limp. The steak tasted like steak ums, which is either good or bad, depending on your particular palate. It was a little chewy and peppery. It was a overkill since there was already a burger underneath it. The cheese, caused serious problems for the burger, contributing to the dryness and lack of peppers and onions in most of my bites. I’ll admit then I’m partial to Swiss cheese, and here it had a nice taste and definitely added some great flavor to the burger. However, the American cheese was just a gooey mess. 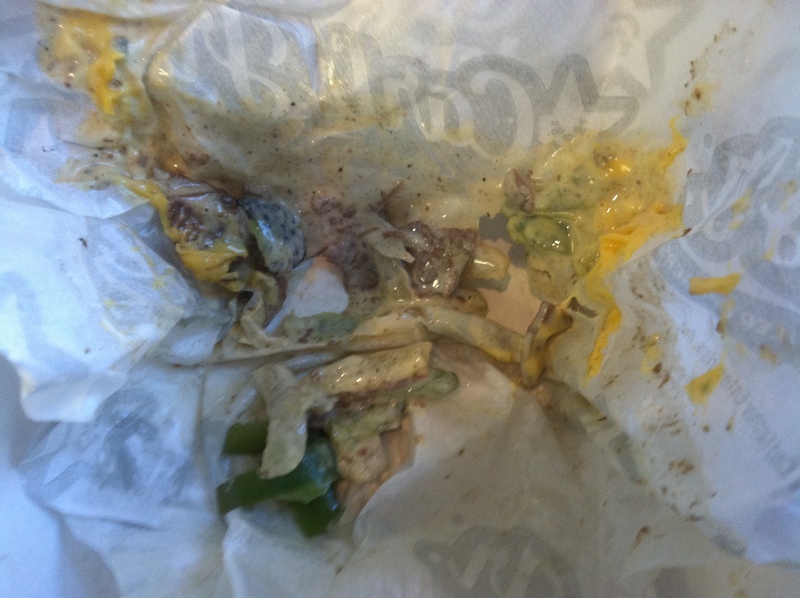 It made the burger slippery and caused toppings to fall out the backside of the bun, creating a disgusting looking deposit of yellow cheese, peppers, and onions. Even with the paper around the burger, this was a mess by the end of the meal. Well, I feel kinda bad here. 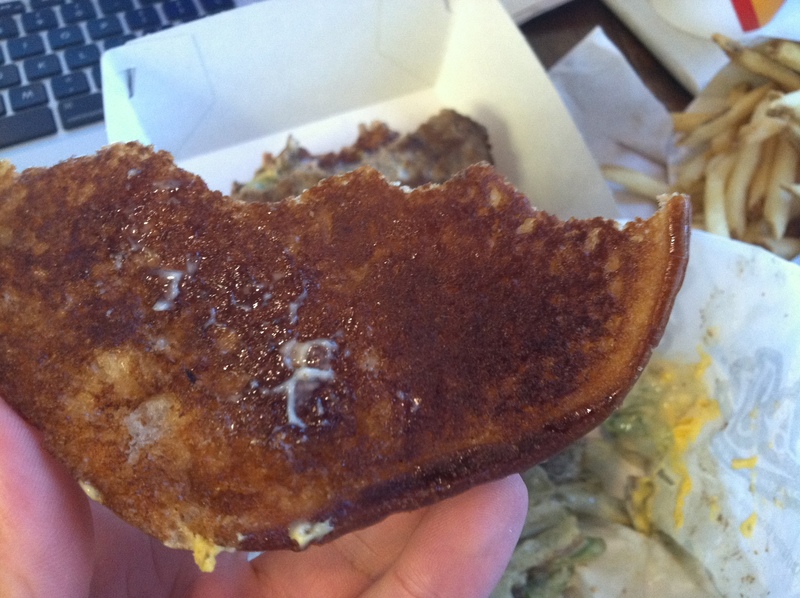 I started this blog, proclaimed myself a lover of fast food, and this is the third straight item I didn’t like. 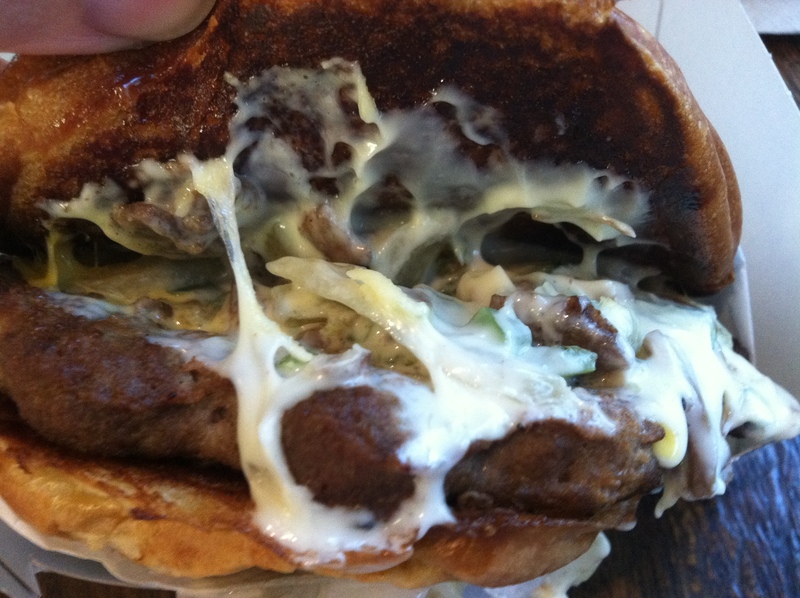 There wasn’t enough of the cheesesteak mix, and what little made it onto the burger was too concentrated in one area. Too many bites were dry burger, dry bun, and some cheese. That’s unacceptable for a burger this expensive. Maybe turning this into a cheesesteak hoagie burger and adding some lettuce and tomatoes would help out. At least there’d be some variety. 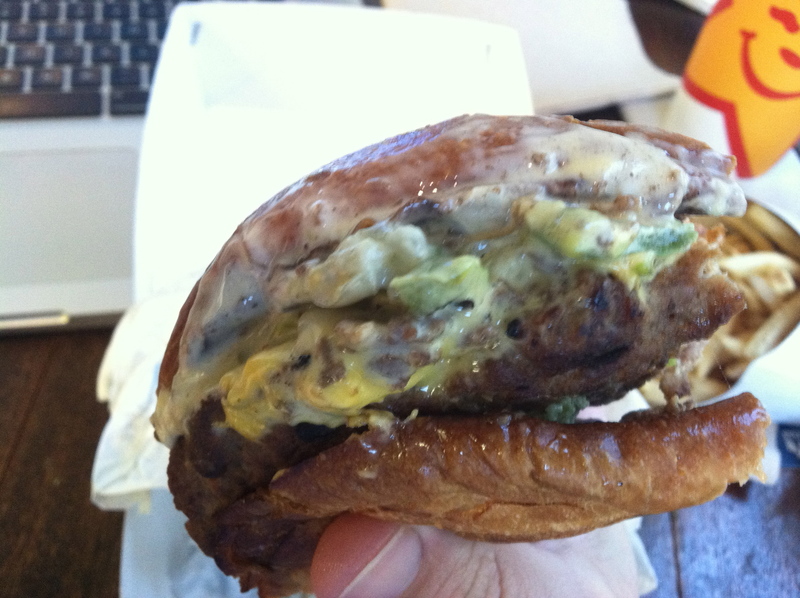 If you find yourself at Carl’s Jr. in the future, go for the Guacamole Bacon Burger. It’s just as messy, but the ingredients mesh well and it just tastes better. 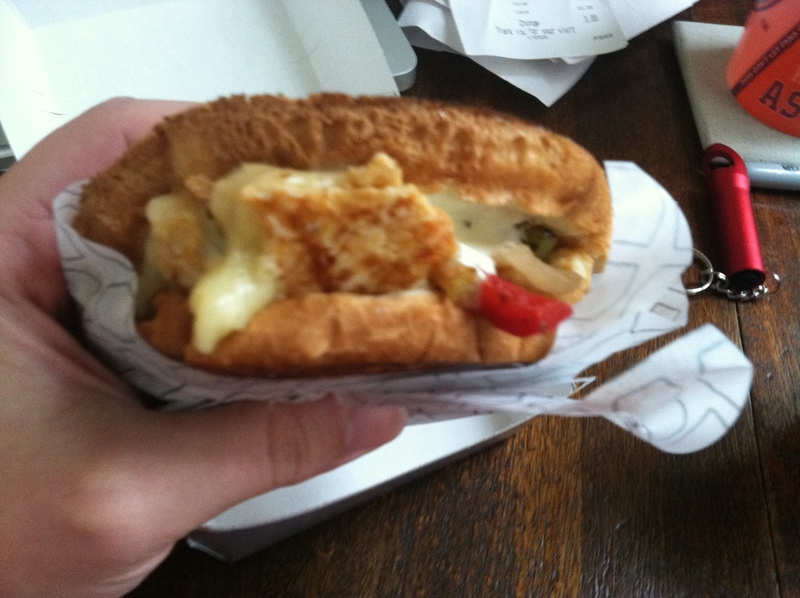 For the next installment, I decided to take a trip to Jack in the Box to test drive their Fajita Ranch Melt. I was really excited for this one. Fast food grilled chicken sandwiches have always been a weakness of mine, and I like fajitas as well. How could this not be a hit?! I opted to get the meal, medium size, with curly fries instead of regular fries, which set me back $7.05. Nothing out of the ordinary with that price, either in a good or bad way. Thankful for that extra layer of paper! The sandwich came wrapped in paper inside a box. That extra paper was necessary because of the sourdough bun. Those always have a tendency to be greasy and can cause burger slippage, so I appreciated the extra layer between my fingers and the bread (which also makes it easier to take notes and photos while I eat, instead of wasting twenty napkins during the eating process, because this sandwich was messy). The taste of the sourdough was standard Jack in the Box: it’s nice to get different texture and flavor than the standard fast food bun, but it’s nothing revolutionary. 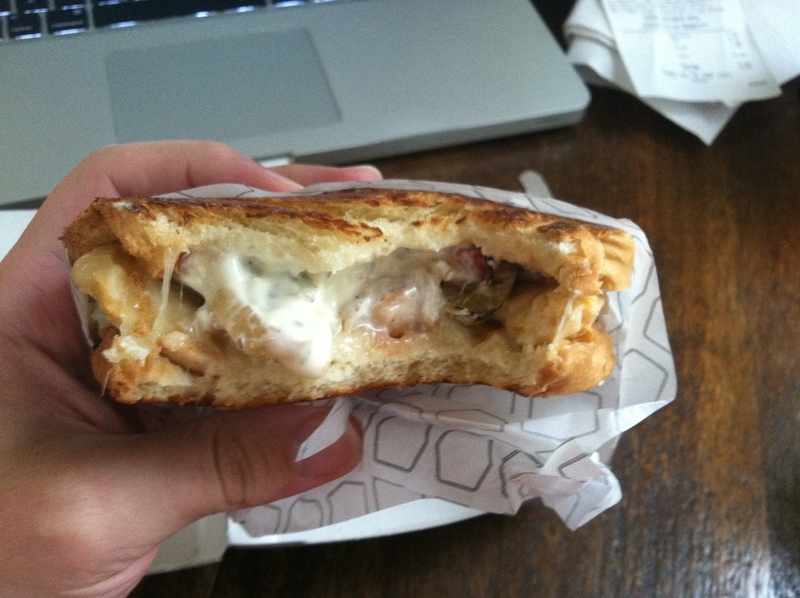 Digging into the sandwich now. 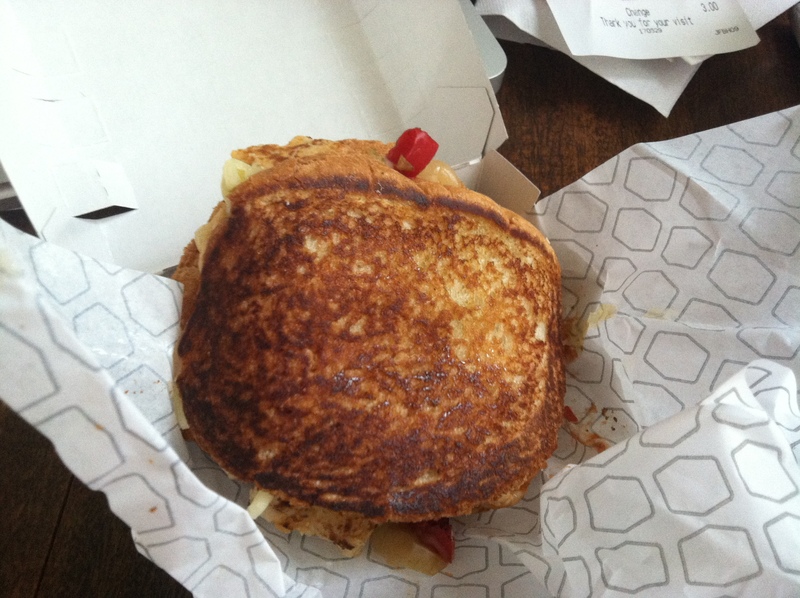 Jack in the Box describes it as “Fajita Chicken topped with grilled onions, fire roasted red & green peppers, melted pepper jack cheese plus Ranch and Taco sauce.” Needless to say, there’s a lot going on here. My first bite was fantastic. I somehow managed to get all of the elements in an equal proportion. The chicken held up to the cheese and sauces, while the onions and peppers added some crunch to the proceedings (though not much in the flavor department). Unfortunately, things started to go downhill after that first bite. The first problem may have been self-inflicted. 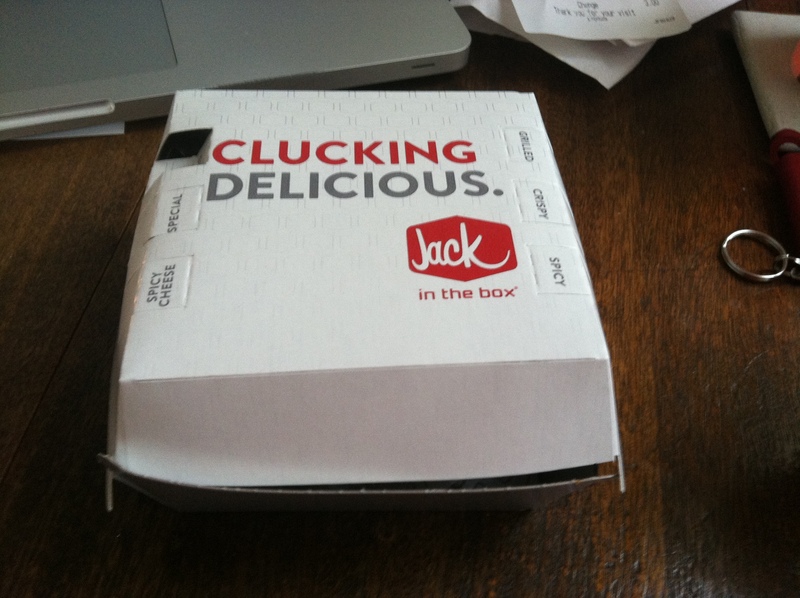 I opted to use the drive-thru and eat at home instead of eating at Jack in the Box. While the ride home was less than five minutes, the pepper jack cheese had definitely congealed by the time I began to eat. That was pretty gross. So instead of being nice and melty, and combining with the other ingredients of the sandwich, I’d occasionally get congealed cheese bits when I took bites. Congealed pepper jack is not very good. Next, I’ll preface this by saying I’m not a huge fan of Ranch sauce/dressing. In moderation it can be fine, but I’ve never eaten something and been struck by a desire to add Ranch to it. With that in mind, the Ranch is way too overpowering here. There was too much in amount, and it started to take over the sandwich. If Ranch were a good accompaniment to a fajita, I could understand its inclusion. But it isn’t. At all. I think Jack in the Box would have been better served by just making a Fajita Melt and ditching the Ranch. They could do this by combining the taco sauce with sour cream or guacamole, or even adding some real salsa. The flavors would have been a better match plus, once again, no Ranch. The only compliment to the Ranch was that it seemed to have a nice spice to it, but adding some heat to the sandwich could have been achieved through less obtrusive means. Getting to the other parts of the sandwich. The onions and peppers suffered the same fate as most fast food vegetables: they lack flavor. I understand that it’s difficult to cook then freeze then reheat vegetables and expect them to taste fresh, but when they serve nothing other than to add crunch, why not just add tortilla chips or something to the sandwich? The chicken was fine; it tasted like normal fast food grilled chicken. If you like it (and I do), it’s not going to let you down. I couldn’t figure out what made it “Fajita Chicken” though. Regardless, it’s a good vehicle for all the flavors Jack in the Box is going for here. P.S. Please excuse the sloppy picture formatting. For some reason the pictures are centered in the post editor, but are not in the published post, and I’m not sure why there’s a discrepancy. I’ll keep tweaking until the formatting is correct. 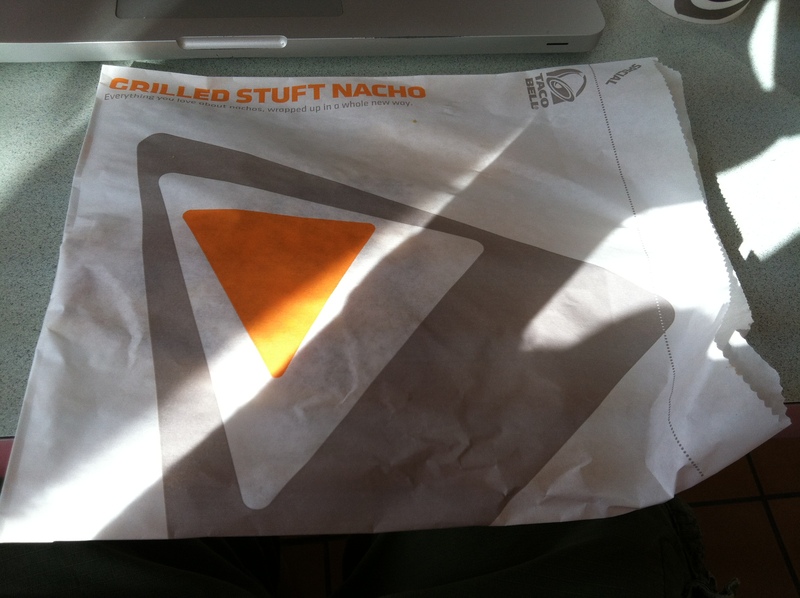 If you’ve been watching TV lately, then you’ve likely seen some (re: many) ads for Taco Bell’s new Grilled Stuft Nacho. While I can’t comment of the effectiveness of their ad campaign, I was intrigued enough by the photos of the food to have a craving for some nachos, grilled and stuft style. The Grilled Stuft Nacho (GSN) is priced at $1.29, though I opted for the box meal which comes with a crunchy beef taco (old reliable! ), a beef burrito supreme (lettuce does not belong in Taco Bell burritos), and a medium soda. Luckily the box itself is filling, since I think I’d need probably 3 of the GSNs to make me full. When I opened the wrapper, the GSN was not as filled out as the commercial makes it seem (shocking, I know!). As a result, the GSN is thin. Like really thin. It looks like a flatbread. The outer layer is reminiscent of the Crunchwrap Supreme. I expected something… uh, crunchier, like a nacho, instead of bread. I’m not a fan of this outer layer, and the few bites I had without any filling were not pleasing. Taco Bell says the filling comprises of “seasoned beef, warm nacho cheese sauce, … zesty nacho sauce, crunchy red strips, and …sour cream.” I personally could not taste the difference between the nacho cheese and nacho sauce. I just thought it was nacho cheese. 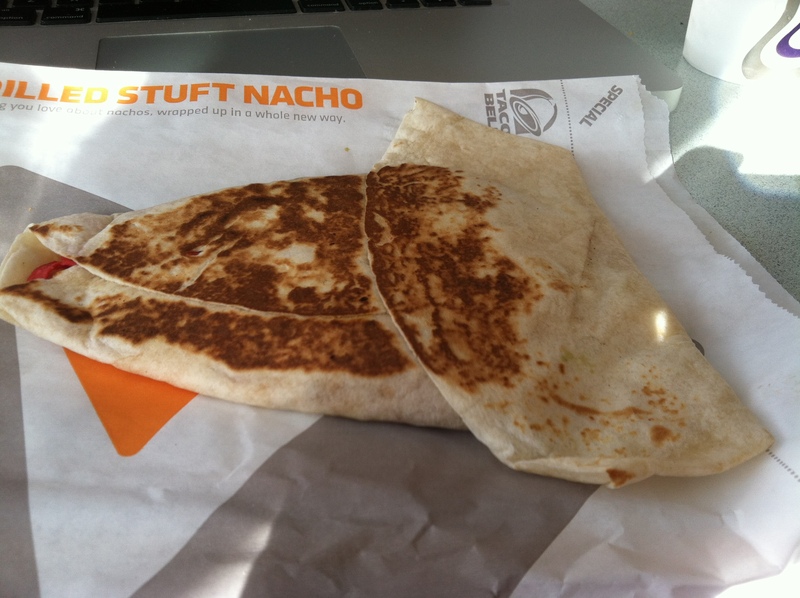 The filling suffers the from the same problem as a lot of Taco Bell products: it’s not evenly apportioned. My first few bites were only sauce, bread and the red strips. It took about 1/3 of the way through the GSN before I reached any of the beef. Other times, a bites were solely sour cream. The few times I did get all of the ingredients at the same time, I thought it was a nice blend, but those good bites were too few. So my verdict is so-so. 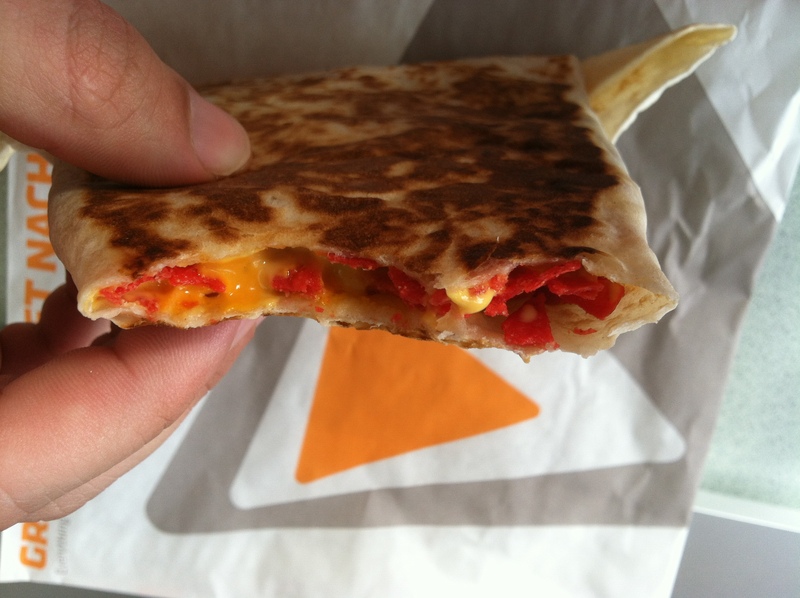 The Grilled Stuft Nacho is not something I’ll crave and need to stop at Taco Bell for. I’m glad I tried it, but this was not as good as I hoped it would be. It also doesn’t help that Taco Bell has so many cheaper options that taste better. If I’m looking for one extra item to round out my meal there, I’d probably rather save a few cents and just get a regular taco instead of the GSN. This has potential, but I think Taco Bell would need to rework the breading and make sure employees even out the filling. Note: This post has been edited. I originally wrote that the GSN is $1.79, however that is incorrect. The correct price is $1.29. Welcome! If you’re here, either you got here through searching for fast food or you’re hopelessly lost. Regardless, you should stay awhile and read through some posts! To help you out, here’s a handy FAQ of what I hope to accomplish here. Q: Why the hell should I read anything you have to say about fast food? What makes you an expert? A: Well, the honest answer is that there is no reason to read my opinions because I’m writing about food! It’s all subjective. 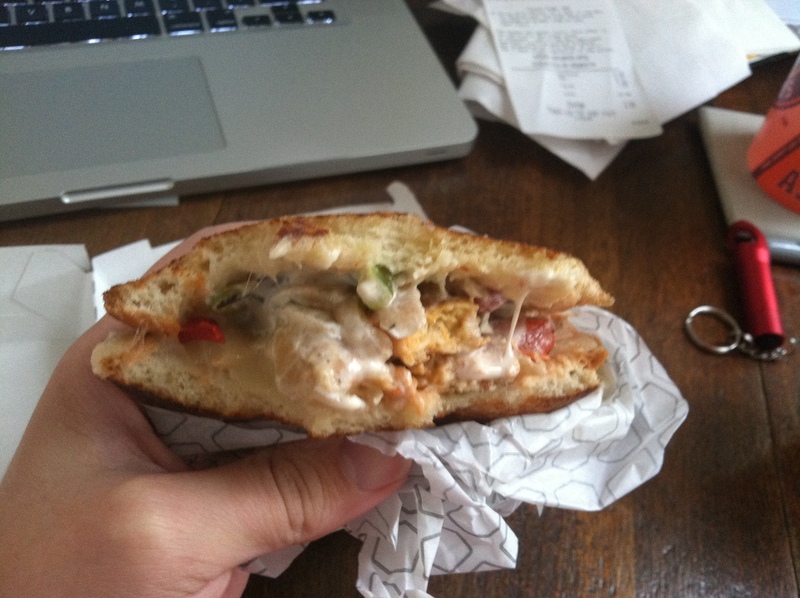 However, I do fashion myself to be a fast food connoisseur (hence the blog’s title!). I worked at McDonald’s for about four years, and somehow never got tired of the food. In fact, I actually increased my consumption during and after my employment. I have eaten fast food in every single country I’ve visited; no matter where I am, I will single out at least one meal solely devoted to sampling the local fast food scene (which usually means McDonald’s). In addition, in the good ol’ US of A, I will go out of my way to eat at different fast food locations. I have driven an hour to and fro for Long John Silver’s and Sonic. I ate Church’s Chicken from a gas station in Texas. And I still remember how Burger Kings used to smell, before they switched to the new fries (okay that one’s just weird, sorry). Q: How are you still alive/are you worried about your impending heart attack? 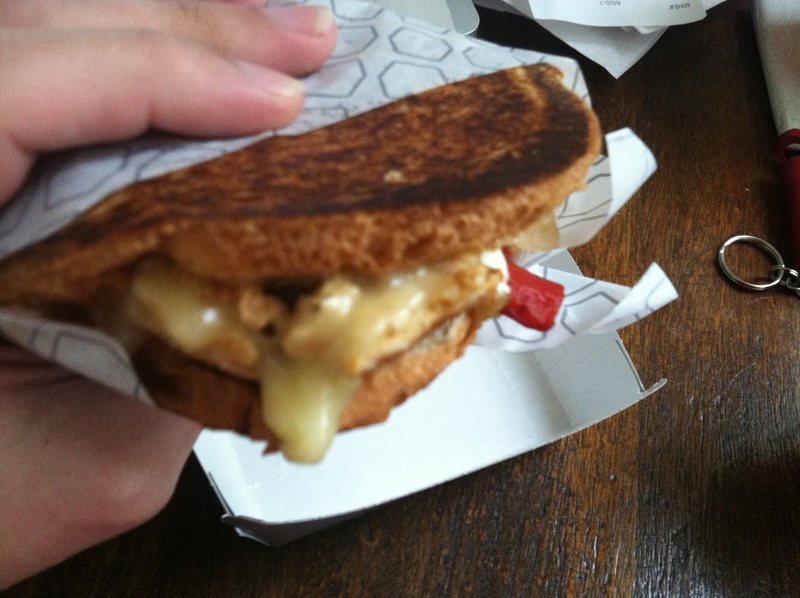 A: No clue/I sometimes order grilled chicken sandwiches! Q: What’s this blog going to look like? A: My current plan is to post at least once a week. Ideally, I’ll be going around to different fast food location and trying new products. Luckily I live in an area where there are plenty of options to choose from. I’ll describe what I ate, what it looked like, if it lived up to my expectations, and if I’d eat it again. I’ll add some photos to enhance the experience, and hopefully I paint a good enough picture to either encourage or discourage readers from eating the food. Essentially, I’m your guinea pig (and let’s ignore the fact that I’m also using this as an excuse to eat more fast food). While I do my best to keep on top of new products, if something has slipped through the cracks and you want me to review it, let me know! If possible, I will eat and review it. With that out of the way, thanks for stopping by, and I hope you enjoy reading about fast food!